. 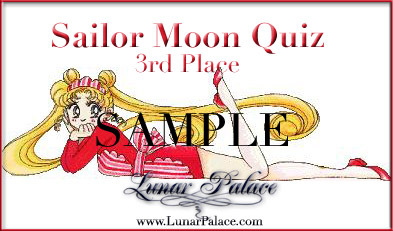 : Lunar Palace v.5 - Japanese: Sailor Moon Quiz (Introduction) :. How much of Sailor Moon do you think you know? NOTE: The requirements for this quiz are not easy. The questions are from the Japanese series only. There are 25 questions total. The purpose of this is to see how much of Sailor Moon you think you know. Some questions will make you think, so be prepared. 11 questions are General Questions - I'm not going to say that you can't use this site or another site to help you out, but if you feel like digging around to find answers that's fine, but I would prefer that you do it on your own and it would take less time. Sailor Moon, Sailor Mercury, Seiya, Mamoru, Luna, Taiki, Sailor Pluto, Sailor Venus, Chibi Chibi, Yaten, Sailor Uranus. These questions are pretty much on any site under "profiles". This might be the only section that you can find the answers to on any site. These should be pretty easy. I'll be giving out 3 awards to the true moonies (scroll down for details). 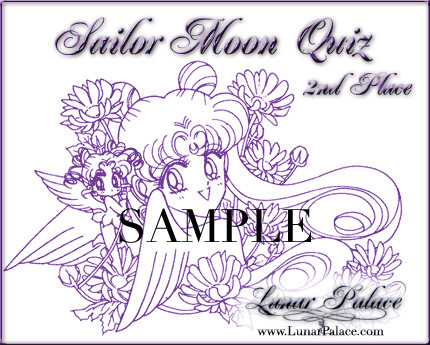 If you have passed this quiz, you will be given an award to put on you site saying how you are a Sailor Moon Know It All (aka: a True Moonie)!! Important: You should receive an e-mail from me in about 1 week or hopefully no longer than 1 1/2 weeks. Even if you did not pass the quiz you will still receive an e-mail from me, informing you on how you did. None of the questions can be left blank. You must fill out the information that is given at the beginning of the quiz, name or nickname, e-mail address, URL, name of your page, and if this is for fun or an award. If you check "for fun" and you wanted an award, you won't get one. I use this information to give you your award, let you know how you did, and the winners of an award are added to the trophy case. You can only win one award. I do check to see if you have won any of these awards. If you have two separate sites and are not built together as one site, then I will award you one award for each site. The U.S. and Japanese episodes are very different! There are 25 questions total!! Your answers will be deleted if you go off of this page! You will be disqualified if all the information is not filled out! This quiz may be hard, it all depends on how much you know. Double check your answers and personal information before you submit the quiz. If you check "for fun", you will not receive an award! There has been some problems with understanding the rules and standards of this quiz. If you take the quiz for fun, you do not get an award if you pass the quiz. So don't put down that you're taking it for fun, but you want an award if you pass. People are sending in two quizzes a day with different answers. If I see that there have been two quizzes sent under one e-mail address and neither one of them have been graded, I will look at the information you have given me and I will see if it is the same, if it is, one of the quizzes you sent will be deleted and it will be at random choice. If you marked one for fun and another for an award, I will choose the one that is for an award. If both are marked for an award or for fun I will delete one without looking at the answers, even if you missed the first 8 questions on one quiz and 9 or more on the other. You'll have to deal with the score that has been given to you. In the "What do you think about the quiz?" box, 97% of the time the response is: "I don't know anything about the Japanese episodes", "I haven't seen them", "Could you change the quiz to an all US quiz? ", "It was pretty hard, because I don't know that much about the Japanese version". The point of the quiz is that (a) it is supposed to be hard, (b) this quiz is here to test you and see how much you know, (c) it's doesn't matter if you have seen the episodes, because there are web site that do talk about the Japanese episodes, (d) and to correct the people who think they are the TRUE MOONIES. For those of you who wanted an all U.S. quiz there is one posted, but there are no awards that are given out. E-mail addresses! Some people don't put their e-mail address on the quiz. Hmmmm.....I wonder how I'm supposed to return the results!! If the correct information is not there, I will delete the quiz. Some people don't put their full e-mail address. Example: Moon7875. What happened to the @aol.com, @hotmail.com, or @yahoo.com? I will delete quizzes like that too. If some of you have not been sent a report on your quiz, chances are the e-mail address you gave was not correct. "pretty good~i didn't know some of the japanese answers, but i answered them all on my own. 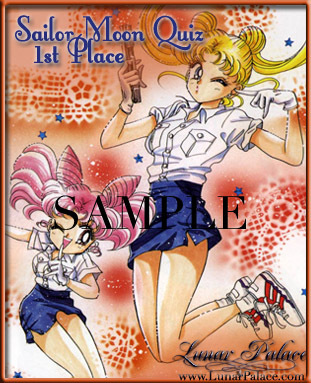 a few weeks ago i read the SMS and SMSS episodes from a site I don't remember.=)"
It's challenging, but a very good test to see what people know about sailor moon." As of June 27, 2001, if I receive another quiz that doesn't follow these simple guidelines, your quiz will be deleted. I have been easy on the people who do not follow these guidelines, but that will no longer happen. Reading this page will not take longer than 5 minutes and the instructions are not that difficult to understand. This page is here so you know how you can win an award and what is needed for you do that and a brief description of the quiz. quiz is about before you take it, what's on the quiz. Remember you don't have to take it if you don't know the Japanese episodes. This quiz is set up to see how much you really know about Sailor Moon!